You are a musician experiencing pain. Here are some suggestions from Coralie Cousin, therapist specialized in the pathology of the musician. Make an appointment with your doctor, as swelling is an indication of a problem. Playing with a swollen joint is inadvisable as the swelling compresses the tendons, nerves and ligaments, increasing the pain. Until you have seen the doctor, it is absolutely essential to rest the painful joint and massage it with a cold pack (available in pharmacies). You must stop playing for a day or two, then start by breaking up your practice time, for example, by playing for 15 minutes then pausing for a couple of minutes (still concentrating on your music). This is just one suggestion among other possibilities. Resting splints or working splints are made by an orthopedist or physiotherapist specialized in the treatment of the hand. Anti-inflammatory patches can be placed under the splint and are often very effective. Here is a suggestion which may or may not work for you. But in any case, remember that getting rid of muscular tension is a good way of preventing tendinitis, the most frequent for musicians being in the shoulder or the elbow. You haven't even started practising yet, but your forearms are already feeling stiff. Being aware of this is a good starting point. To get rid of this excessive tension, you have to proceed in small steps. Once you've warmed up away from the instrument, play for 15 minutes non-stop, but no more. Do this throughout your whole working day. If on the following days you feel your arms are more supple, add five minutes. Then add five minutes per day until you reach half an hour. Stay at this level for a week, then start adding five minutes again per day. Increase to 45 minutes, but don't exceed one and a half hours in one session. This might be difficult to apply because it will sometimes entail making changes to the way you organize your practice time. For example if you go into a church to practise the organ, but you are suffering pain, you should acknowledge these points. Don't worry if it feels like you are blocked in your work or losing time or : it's better to follow this pattern than to have to stop entirely because of tendinitis ! How to avoid contractions: in the evening, after your day's work, lightly massage your forearms. Clay poultices are also effective, but only if used correctly. Important: if you notice pain reappearing, then reduce your non-stop practice time again. Do not accept these contractions as normal. They are the sign that something is not right. If they don't disappear, consult a specialist. Call your doctor and always remember that a shock directly to your hands, elbows, shoulders or anywhere else requires an x-ray. First of all, see your own doctor. He is the one who will prescribe the necessary physiotherapy sessions as well as additional examinations, such as x-rays, scans or MRI etc. If you feel tingling in your hands, your doctor can refer you to a specialist who will do an EMG (electromyogram). It is absolutely necessary then to make an assessment with your instrument. This can only be done by a specialized therapist. The musician's therapist has a number of instruments at your disposal : piano, harp, double bass, guitar... For organists and drummers, the therapist will come to your place of practice. An assessment is made, both with and without your instrument. This will allow an analysis of the factor or factors responsible for pain related to your instrument, for example: when you have overdone things, played in a bad position, increased your practice time, experienced stress, changed instruments or technique, etc. The therapist closely observes you as you play, noting the physiology of your gestures, your capacity to dissociate movements, the dexterity of your hands, and body position, which should be tonic but not tense, etc. For wind instruments, a respiratory assessment is also made. The therapist analyses in detail the harmony of your respiratory movements: the flexibility and elasticity of the diaphragm during inhalation and the tonicity of the transverse abdominal muscle during exhalation, etc. 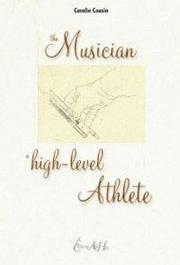 Coralie Cousin, physiotherapist specializing in the health care of musicians, created an association so that musicians could consult different kinds of therapists in one place. Members include physiotherapists, osteopaths, speech therapists for singers and wind players as well as psychologists to help combat stress. Physiotherapists and osteopaths work in a complementary way so that musicians find solutions as quickly as possible. Individual monitoring by therapists who work together around their common passion : music. « Breaks play an important role. In fact you generally avoid them because you feel you will lose your concentration. But it is essential to stop from time to time; your body needs it. After 45 minutes of work your body is tired and needs to rest. You should then stop. Take anything between a few seconds to a quarter of an hour and never play for more than an hour and a half without a break, (unless you have to). Increasing your practice time to solve a technical problem is a mistake, as very often you repeat the same mistake over and over. As a result of this repetition, if your position is not correct you can create injuries. When a difficulty does arise, stop insisting: get up, stretch, move about, walk, and drink a glass of water. You'll be more effective afterwards. If you are preparing a 90-minute concert, practice at home several times during the day that same length of time; if you exceed it you will only tire yourself. If an exam or a competition is approaching, do the same. If your audition is going to last 15 minutes, adjust your practice time periods to this length. You have to be able to give your all in any circumstance during this period of time. Some teachers even rightly recommend that you go through your program at the same time as the audition is scheduled. If you lose a week on a program that needs three to be prepared, then take care not to fall into overwork syndrome. A lot of accidents happen in these circumstances, some even appearing much later on as a result of pushing too hard. « After several hours of practice, your body keeps a blueprint of the instrument. 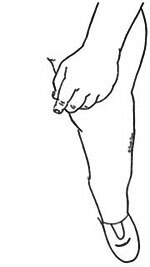 If you spend hours leaning on your left leg, when playing the violin, for example, you'll tend to keep this position in other daily situations. For example, remember to distribute your weight evenly on each leg. A few seconds is enough for your body to register the fact that the instrument is no longer there. Train yourself to rest your body in its axis, so that your tired muscles can really relax. Being in your axis, staying there and releasing, that is what you have to keep in mind. « It is essential to learn to relax your hand while working on the contact of the fleshy part of the fingers. Learn to reduce the tension in your hands when going about your daily tasks: when you press a switch for example or turn a key in a lock. Your doctor may insist that you stop playing in order to calm the pain and allow your body to heal. But it is essential to analyse and understand the cause. After this time of rest, the postural fault which is often at the origin of the problem, must be corrected. 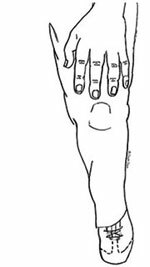 For example, a pianist may be using his thumb in a bad position on the keys and this may lead to tendinitis in his elbow. 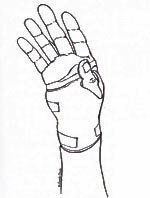 As the elbow heals, it is essential to replace the inherent musculature of the thumb. If you don't make this effort, the risk is that the time of rest will only serve to calm the pain for a while and the tendinitis will return or appear elsewhere. Use this time of rest to make an assessment. Physical pain creates stress as you are afraid you won't make it through your concert. So it is important to feel physically and technically at ease with your instrument. 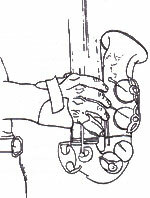 Developing instrumental technique is only possible with good posture, but the opposite is also very important. For experienced musicians, postural balance is prepared mentally: thinking about good posture leads to just the right amount of relaxation in your muscles. This provides assurance and dissipates stress. So don't forget to think about your posture before you start playing in order to overcome your fear. If you are a student, rather than spending hours alone with your instrument, make the most of every opportunity to play in front of different audiences. Many teachers organise master classes for this essential work of gaining self-confidence. Before studying medecine, Theo Leydenbach originally intended to embrace the career of a professional musician. Trained as a pianist under the guidance of Gyorgy Cziffra, he then studied conducting with Edouard Lindenberg. Stage fright, if not pathological and paralysing, should be considered as normally related to the tremendous challenge of public performance. How the other looks at me, how I feel or am afraid to be judged, may however trigger an anxiety impossible to overcome. Much more than being a simple lack of self-confidence, stage fright seems paradoxically to lie in a fundamental lack of confidence in the other. Reorienting our mental representation can thus be part of the solution : imagining the audience or the jury not as a black hole or a devouring monster, but just a collection of individuals, innocent and receptive to new impressions, receptive to the beauty music has to deliver. Through this kind of new confidence the musician can feel connected to an audience that is not anymore perceived as hostile, but instead turned into an assembly of friendly people eager to accept what he offers them as a gift. Disinfectant, for example transcutaneous Hexomedine or unidoses of Betadine. Pain patches and anti-inflammatory patches (Flector, for example) with self-adhesive strips to hold the patch in place.